My name is Glenn Blackman and earlier this month I gave a talk at the Pestalozzi International Village, in Sedlescombe, to a group of their students. Sean Morrow, my business partner, also provided his thoughts on some of the topics. The presentation was titled "Entrepreneurs", and it was intended to introduce the students to what being an entrepreneur is, my personal experiences of what is important when you are thinking of starting a business and how our business is providing help for entrepreneurs. Pestalozzi is a charity that finances the education of a select few, exceptional children, from around the world, that they believe will make a difference to the world. The charity desperately needs financial donations, so if you are able to help you can donate here: http://www.pestalozzi.org.uk - please mention FundInvoice if you donate. Below is an overview of my presentation, and the questions that were asked by the students, together with my answers. A person who makes plans and puts them into action. An investor of money, but also of time. A quick Google search provided the following definition: "A person who sets up a business, or businesses, taking on financial risk in the hope of making profit". However, as one student pointed out, that still does not quite cover it. This particular student's ambition was to start a not-for-profit organisation - is that not also entrepreneurial? The examples that spring to mind are people like Sir Richard Branson and Lord Sugar, but for all 5.4 million businesses within the UK there is an entrepreneur behind that organisation. We only really hear of the top 1,000 most successful business entrepreneurs, but they represent just 0.02% of all the business founders in the UK. Over 600,000 new businesses are founded each year in the UK. I would not consider myself to be an entrepreneur, but I guess I am by that definition. I started running my own business in 2000. With the founding of FundInvoice LLP, I feel we have created a great business that affords the perfect work life balance. FundInvoice is a brokerage for invoice finance and other forms of business finance. We do not lend any money, hence we don't take a risk that we will lose any money if a client fails to pay. Our role is to find and introduce prospective borrowers to lenders so we consider ourselves a marketing organisation, as we are experts in connecting with the market of businesses that are seeking invoice finance. We deal with established finance companies, often large banks, so we have very little debtor credit risk to worry about. Most of our debtors pay very quickly (within a few days) and many are self billing, where we don't even have to raise an invoice. Our business is what I call "symbiotic" with both customers, and the finance companies. The customers don't have to pay anything for a quote search and advice, the finance houses don't have to pay anything for the introductions, FundInvoice are paid a commission by the lender, in respect of any customers that choose to go ahead. Those commissions are for the life of the customer so, over time, it creates a steady future income stream for us. We have been nominated as "Finalists", two years running, by both the 1066 Business Awards, and the Business Moneyfacts Awards. FundInvoice is both a zero investment and a zero marketing budget business. That means we had no investment in the business to start with, i.e. it is a product of only our personal efforts. We do not spend anything on advertising or marketing, at present - again it is only our personal efforts that serve to market and promote our business. Also, we don't have the overhead of an office, we work from home, we don't have large numbers of staff and the wages bills to go with them. Our model leverages technology in order to minimise the amount of operational support infrastructure that we need in order to run our business. This technology connects businesses direct with financiers. We estimate that we could handle a significant increase in our business volumes without any further increase in our cost base. Much of what I personally do is based online, to do with our website, finance blog, FundingVoice magazine and the general management our business. Therefore, I can work really flexible hours, which is great when you have a young family. So many businesses measure their success based on their numbers of employees and the amount of investment capital that they have raised. We measure ourselves on profitability. 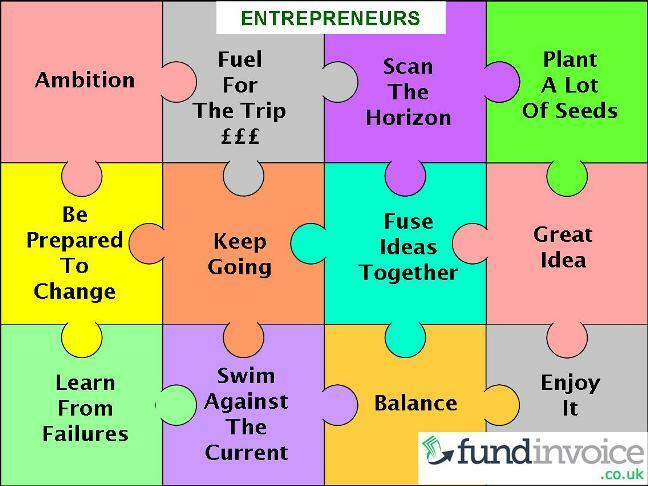 <a href="https://www.fundinvoice.co.uk/entrepreneurs/help-for-entrepreneurs-pestalozzi.html" ><img src="https://www.fundinvoice.co.uk/images/help-for-entrepreneurs.jpg" alt="Help For Entrepreneurs by Glenn Blackman of FundInvoice" width="648" /></a><br /><a href="https://www.fundinvoice.co.uk/entrepreneurs/help-for-entrepreneurs-pestalozzi.html" >Help For Entrepreneurs</a> by <a href="https://www.fundinvoice.co.uk/" >Glenn Blackman of FundInvoice</a>. You have to have an ambition of starting and running your own business. I always felt that was what I wanted to do. I watched my father start various businesses when I was a child and everything about new startups appealed to me. When I was given a snooker table for my 10th birthday I started a snooker club, charging the local kids to play. Later at school I bought and sold things to make extra money, and then started drawing pictures of animals and children for people. When I started my first proper business (in 2000), I had the benefit of having received a redundancy package from my previous employer. That gave me the financial cushion to be able to spend my time developing the business, rather than working to pay my bills. People often underestimate how long it will take to get a business off the ground. Whatever financial cushion you think you are going to need, it is probably best to at least double it, to allow for unforeseen delays in achieving your growth aspirations. It is also wise to know something about what you are planning to build your business around. If you don't have any knowledge of the sector that you propose to trade within, it will be very tough to establish and build a business, not impossible, but difficult and potentially risky. Within my sector I have seen examples of individuals without any sector experience misreading the market for their proposed offering, and suffering delays in growth due to that judgement. I spend much of my time scanning the horizon for new innovations and changes. Much of that activity is web based, I use a lot of news feeds, social media and alert services in order to stay informed about what is going on in the world, business and the financial sector. I think its one of the key aspects of running your own business, and coming up with innovative ideas. Also, talk to the people you meet - that can lead to new idea, or sense checking of your existing ideas. Read our Guide To Expanding Your Business. It makes good business sense to spread all aspects of risk. If you have everything concentrated into one idea you are vulnerable to a problem with that strand of activity. For instance, new legislation could eradicate a niche market overnight, and therefore I would strongly recommend having more than one "string to your bow". Half of new businesses do not survive beyond 5 years (according to the British commercial insurer RSA, as published in The Telegraph). Therefore, it makes sense to nurture multiple strands of business activity at once. You wouldn't plant just one tomato plant - you would plant several to mitigate the risk that some might not make it. One student pointed out that they have been told to put all their effort into one thing. My response to that is that I feel you still are doing that by adopting my approach. It does not necessarily follow that you need to have lots of separate businesses, its more a case of multiple strands of activity. For instance being completely dependent on one source of business is not sensible, having a spread of businesses sources would seem wise. I have cultivated various business activities. Initially business and marketing consultancy, turnaround consultancy, telemarketing, customer research, market research, invoice finance brokering and business finance brokering. Over time, the activities that have been most productive I have continued to pursue, and others I have moved away from. Adaption to the business landscape is key to running any business. In my case I was running a small telemarketing organisation, many years ago and it was a tough sector to work within. Customers always had very high expectations of the amount of business they would reap from the telemarketing activity, and in some cases they were even relying on getting new business in order to pay us. We also had a growing team of people working as telemarketers, which became a nightmare to manage. We diversified into the research sector and found that our customer satisfaction levels increased dramatically, it was far more satisfying to work within research, so we moved out of telemarketing altogether. Tenacity is part of being an entrepreneur, but so is knowing when its time to change direction. Listening to feedback from other people is crucial. Its tough to know when to listen to opinions that contradict your own, and when to go with your own gut feel, but old episodes of The Apprentice are littered with examples of teams not having paid any attention to the market research, and then paid the price. Its worth checking you ideas against "sounding boards" such as your market and your contacts, to sense check them so you can adapt if necessary. There will always be tough times when you are running your own business. Keeping going through those tough times is difficult, but you just have to keep pressing ahead, even when you feel like you want to give up. Having taken bad debts when customers failed to pay I know how demoralising that can be, especially when you have done a great job. You have to have confidence that you can move to a better place, if you keep going. When I was working as a marketing consultant, I produced a marketing plan for a client recommending telemarketing. That led me to look into telemarketing providers, and some of the quotes I found were really expensive. That lead us to start undertaking telemarketing work ourselves. However, it was when a contact of mine started a finance brokerage, that I had the idea of using our own telemarketing resource, to generate finance leads for our own brokerage. Fusing these two ideas together was how we entered into business finance brokering, although our method of acquiring clients soon moved away from reliance on telemarketing. Our really great idea was putting together the business finance brokerage with our research capability. This enabled us to undertake a lot of market research, within the business finance sector, and to identify the top service providers, and the cheapest prices. We could then use this information to guide clients to the best factoring companies for them. Failures are likely along the way, you have to learn from them and move on. Business Insider UK magazine reported on 15 of Richard Branson's business ventures that were failures. The current President-Elect Trump has also had several businesses that have gone into Bankruptcy. Even Lord Sugar has been candid about some of his business failures in an interview with the Radio Times. Even if you entire business doesn't fail, you will have strands of activity that don't produce results. Learn the lessons from failures and focus your efforts on what works. There is no book that can tell you how to create and launch a successful business. There is plenty of advice available, but you need to put it into practice yourself. Often that will mean swimming against the current of popular opinion. In my case I would suggest that a zero investment business, with no marketing budget would be considered going against perceived wisdom. However, we have turned that into a highly profitable niche business. Nothing truly innovative is going to come of doing exactly the same as everyone else. It is only recently that I really learned to appreciate balance between work and life. I have the flexibility of being able to work at night so I can spend time with my family during the day. When you start in business, or even in a new job, you are often encouraged to work all the hours in order to succeed. That is fine, but there is more to life than just running businesses. In my opinion, having a balance between work and family, friends and other activities makes you a happier person. If you don't enjoy running a business - being an entrepreneur is just not for you! Many people tell me that they struggle staying focused when working from home. I have never had a problem working from home, as I really enjoy what I do, and feel I want to do it. Hence motivation is never an issue. Q: What is the biggest cause of failure, in your opinion, of new startups? A: Probably running out of money. Costs are often higher than expected and lead time to achieve profitability can be longer than expected. Businesses need a steady cash flow in order to be able to cope with those issues. Much of what we do at FundInvoice is helping new startups with finance arrangements designed to improve their cash flow. A: A big question, and one to which there is no simple formula. Everything about success on the internet is really down to creating something that people are truly interested in, and promoting it. My only suggestion would be to look for an idea that people are going to want to share via social media. A: Despite how it sounds I still have plenty of time to sleep at night! Q: How can you fund a new startup business, and should you get investment or borrow? A: Well we specialise in funding for new startup businesses but there are many routes that you can take. If you have the money yourself its probably the cheapest route, if you have friends, family or contacts that can lend you the money that is the next option. Beyond that you could consider investors or lenders. The key difference is that normally an investor will want to take over a percentage of your business, whilst a lender will just need to be repaid, with a margin (e.g. interest rate). My preference would always be to borrow rather than attract investors, as that preserves complete ownership of the business. However, the best route is likely to depend on your business situation. Q: Is there a law that makes businesses give to charity? A: No, there is no legal requirement. In my opinion it is better to create a culture where businesses feel they want to contribute, rather than relying on a mandatory law. Q: Do you give to charity? A: Yes, but we also like this kind of opportunity, to give some time to pass on knowledge through events such as this one. We have also undertaken a review of some of the Pestalozzi marketing activities, free of charge, to try and help. Q: Does a Limited Liability Partnership pay tax? A: Yes, as an LLP (Limited Liability Partnership) the partners pay personal tax on the LLP's earnings. This is instead of corporation tax, that a limited company would pay. Q: How do you keep motivated? A: See the answer here. The funniest question was directed to Sean Morrow, my business partner: "How do you put up with him?" - I won't publish his answer!